Little remains today of the Gabriola Brickyard except for piles of broken bricks on Brickyard Beach and the name of the steep hill on South Road. 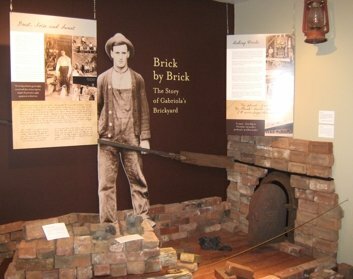 But from the end of the 19th century to 1952, the Brickyard was Gabriola’s single most important industry and largest employer. Bricks were shipped off-island for construction of buildings in Nanaimo, Victoria, Vancouver and New Westminister, BC. For more than five decades the Brickyard shaped the lives of Gabriolans, as well as hundreds of island families, Chinese contract labourers, and immigrant workers. Now Gabriolans and visitors are able to experience life in the Brickyard. The exhibit offers a glimpse into a past when Gabriolans crafted the very bricks that built the cities and towns of this province. 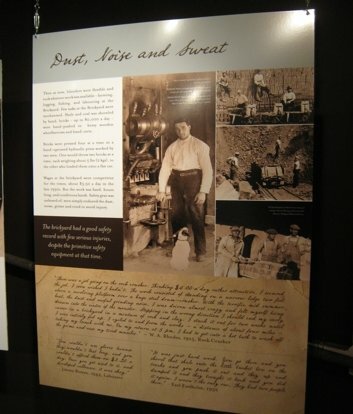 It was also a time when work could be brutally tough, and often dangerous. 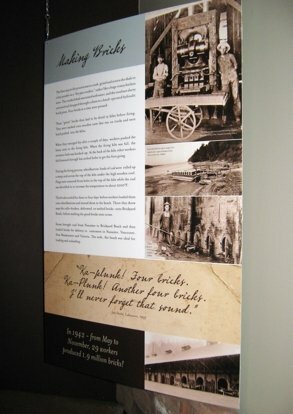 However, the rewards were also great, and the Brickyard workers left an indelible record in the industrial and social history of the Gulf islands and British Columbia.